Have you ever thought about homeschooling, but wondered how in world you’d combine homeschooling with your job? It can be done. Really. Once upon a time, there was a highly motivated, intellectually curious 5-year-old boy. Midway through kindergarten, he declared he “hated school.” His parents were a bit surprised. They knew (from experience!) that almost all kids hate school at some point, but they didn’t expect their little one to hate school so soon. At first, they glossed over their son’s complaints. Towards the end of the year, though, his mother asked the little boy why he hated school. Because, the boy said, if they would just call on me first we could go home in 20 minutes! The boy, they learned, was bored in school. He missed free time and time at home to explore his own interests. He wanted to learn multiplication. The parents hoped their son’s problems would work themselves out in first grade. But that didn’t happen. He remained bored, and he started having trouble on the playground as well. He wanted to play intricate pretend games; the other boys wanted to push and shove. The boy’s teacher said she thought the boy was more mature than his peers, and his parents agreed. Agreeing didn’t really solve the problem, though. Their son still hated school, still craved time to explore his own interests. Eventually, the parents pulled their son out of school. Midway through his first grade year, the parents brought the boy home to homeschool him. And for the next seven years, the parents more or less successfully juggled adult employment and home education. The boy is now 15 and a self-employed entrepreneur. He runs his own lawn care service and is establishing a custom lure business . (Fishing is one of his passions.) He’s due to start his sophomore year at a local public school. The boy is my oldest son. (If you want to know more about homeschooling journey, click here and here.) During the years we homeschooled, I transitioned from a career in nursing to a career as a freelance writer. My work hours varied from very part-time to part-time to full-time. Now, post-divorce, I support my family with my earnings from my writing career. Is it possible to homeschool and work? You bet. Is it easy? No way. 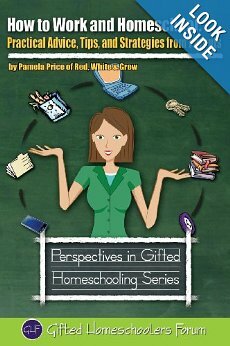 That’s why I’m glad Pamela Price has written How to Work and Homeschool: Practical Advice, Tips, and Strategies from Parents. Too many parents still think of homeschooling and working as either/or options. It doesn’t have to be that way. It is possible to facilitate your kids’ learning while earning an income. BB: You bust a lot of homeschooling myths in your book. What one homeschooling myth do you wish you could abolish once and for all? PP: I’d like to put an end to the idea that we’re all stock, evangelical characters from reality television. Within the homeschool community, there is great deal of religious, ethnic, and social economic diversity. As homeschooling secularizes more, that diversity is growing each year. I think that is fantastic because more people participating and sharing their experiences means that we’ll benefit from new ideas and fresh perspectives. BB: Only a century ago, most families learned and worked together. But now, most people seem to think that working and homeschooling is an impossible proposition. Why? PP: That’s a wonderful question with many answers. One of them is this: our culture has come to regard schools primarily as daycare facilities. Keeping kids together frees parents up to work. Yet, as I learned while researching the book, a lot of parents are no longer okay with that model and their making changes in their lives to recombine home education and work. BB: One thing I learned as a working, homeschooling parent is that working and homeschooling can positively affect the parents and the children. How do you think kids benefit from working, homeschooling parents? How does homeschooling benefit the parents? PP: Children can benefit from being around working parents–both work-at-home parents generally and working homeschool parents–by witnessing many of the realities of adulthood and earning a living: working with a deadline, juggling multiple projects, managing time, etcetera. Conversely, in returning education to its roots–the family unit, adults benefit from living in a home where learning is lifelong rather than something that ends at graduation. I refer to our home as a “life-long learning lab,” because we’re all students of something. BB: What are some of the reasons that parents of boys decide to homeschool? PP: Many parents of boys gravitate to homeschooling because of the freedom it provides to tailor the school day around the child’s energy levels. I’ve encountered many parents who felt that their sons were unfairly labeled “hyper” or some other negative concept and pigeonholed as a “problem” in public school. While some of the kids do indeed have ADD/ADHD, sensory processing disorder, or some other issue and seek treatment, many do not meet the diagnostic criteria and simply need more time for physical activity to optimize their personal potential. I keep in frequent touch with many parents of gifted kids through my volunteer work with Gifted Homeschoolers Forum, and I’ve found that many of those children experience “overexcitabilities” (emotional and physical) that make a traditional school setting especially frustrating, whatever their gender. I’ve noticed for parents of young gifted boys in particular, however, there is a direct correlation between boredom and the expression of the overexcitability (ex. talking too much or fidgeting excessively) that can be easier to manage in a homeschool setting. BB: How can working, homeschooling parents of boys balance their need for quiet time to work with their boys’ need for activity? PP: Speaking from my own experience as the parent of a high-energy kid, it’s important to have frank discussions early on about why our bodies crave activity and rest and how we work as a family to meet these needs. We follow a weekly and daily activity diet that serves us both: my son gets to expend energy at the park, in the yard, on his bike and I get “down time” to read or work while he pursues his interests (game design, reading, and, yes, Minecraft). I’ve also been known to pack up my work on the laptop and take it to the park or, in poor weather, a fast food restaurant with a playscape so that he can play vigorously. BB: Do you have any other advice for homeschooling parents of boys? PP: Yes! Consider incorporating martial arts into your daily homeschool routine. Karate and Tae Kwon Do offer a powerful means of channeling all that boy energy and teaching kids ways to self-defense, but when practiced regularly they also induce a physical state known as “flow” that has positive outcomes for thinking skills and creativity. There’s the self-discipline aspect, too, which will be useful in adult personal and professional lives. We’re fortunate to have an incredible dojo near us, and I consider our martial arts activities as essential to our primary long-term goal here: the maturation of a healthy, compassionate, and capable young man.And that’s what we’re all after, right, as parents of boys? To see our sons grow up to become well-rounded young men? Homeschooling is one path to that goal. Disclosure: Price interviewed me for how To Work and Homeschool and I’m quoted in Chapter One. I also received a free review copy of the book.